Step One – Zest or peel the lemons, removing only the outer, yellow skin and avoiding as much of the white pith as possible. Combine lemon zest (peels), rosemary sprig and vodka in a glass or ceramic container and seal with a tight-fitting lid. Place the container undisturbed in a dark place for half of your infusing time, anywhere from 7 to 40 days. Step Two – In a saucepan, bring 1 cup of water to a boil and add sugar, stirring over heat until the sugar is dissolved. Let sugar syrup cool to room temperature, about an hour. Once cooled add to vodka/lemon mixture, seal container and return to dark place for the remaining half of the infusing time. Strain the vodka: I used cheese cloth since the zest is pretty fine. Step Three – once infusing time is complete, pour limoncello through a cheesecloth into a large spouted pitcher to remove the zest. If you prefer your limoncello to be more clear, you can strain again with fresh cheesecloth, but it is not necessary. 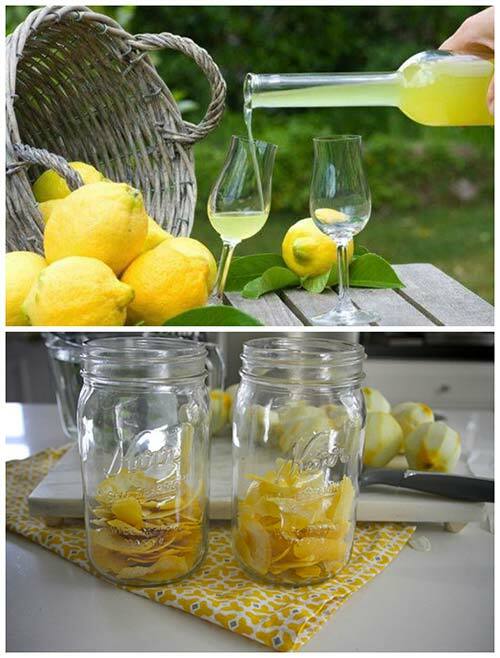 Divide the limoncello into sealable jars and store in the refrigerator for a month or in the freezer for several months.